Cracked and damaged teeth can affect the health of the teeth around them. Choosing a caring dentist who knows how to improve how your teeth look and function can get your dental health back on track. Dr. Gregory D. Kuo in Redmond, Washington specializes in creating customized crowns and understands the importance of restoring damaged teeth. Call or schedule an appointment online to learn more about how dental crowns can alleviate your pain and strengthen your teeth. Dental crowns are coverings dentists use to protect damaged or failing teeth, to secure a dental bridge, or to cover a dental implant. They extend to your gumline, giving a natural appearance that is virtually undetectable from surrounding teeth and they function just like your natural teeth so you can eat, speak, and smile with confidence. Dental crowns can be temporary or permanent and are made of different materials depending on how long they’re intended to last. Stainless steel crowns are used to provide a temporary covering for decaying or damaged teeth while metal alloys, porcelain crowns fused with metal, resin and pure ceramic and porcelain crowns offer varying degrees of long-term protection. Before installing your crown, Dr. Kuo takes X-rays and examines your tooth’s root and look for signs of infection and decay. If your tooth has decayed considerably or if it has the potential to become infected, Dr. Kuo may perform a root canal to remove the tooth’s nerve before installing the crown. 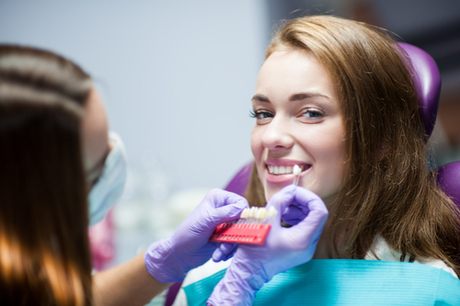 After preparing your tooth for the crown, you receive a local anesthetic to numb your tooth and the surrounding area. Next, Dr. Kuo reshapes the surface and sides of your tooth. A special material may be applied to your reshaped tooth to construct a stable base for your crown If necessary. Then, he places a temporary crown or cap over your tooth. Lastly, Dr. Kuo sends a mold of your tooth to a dental lab where it’s used to create a customized crown. When your custom crown is ready, he cements it to the reshaped tooth. Usually, setting a crown is pain-free and local anesthetic is rarely necessary. With proper maintenance, dental crowns can last up to 15 years or longer depending on the material that was used to make them. They can also improve your bite and the appearance of your teeth. Dental crowns can make damaged teeth stronger and keep your teeth from shifting as a result of a missing or damaged tooth. Call or schedule an appointment online to learn more about how Dr. Kuo can use dental crowns to protect your teeth.